Top-H&M, Jeans-Gap (seen here), Belt-Boyfriend's, Shoes-Steve Madden, Watch-Michael Kors (similar style), Handbag-c/o Foley and Corina, Sunglasses-Ray-Bans, Nail polish-Sally Hanson "Blue Me Away"
This weekend I took time to stop and smell the roses...literally. 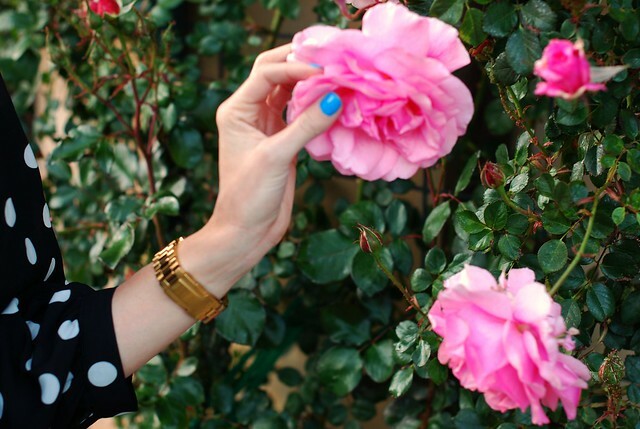 All around town the prettiest flowers are blooming and they work great as an accent to my playful outfit. Bright punchy colors are so fun this season but can be tricky to get used to. When I'm looking for a way to incorporate pops of bright color into my wardrobe without being overwhelming I wear a funky colored nail color or a standout handbag. My new Foley and Corina tote in emerald green is quickly becoming my favorite spring accessory. That bag really does tie it all together. As do your nails. Fabulous pops of color! I love that you are bringing the flared pants back! This is nearly the same look I sported a few days ago! Great minds think alike! Gorgeous outfit. I love the bag - absolutely amazing. I love how versatile that bag is! Great bag.. I love the pop of color!! Love this as usual! You look gorgeous and so stylish! The pops of color are perfect! I love how your outfits are always so simple and chic! love the dots and pops! your new green bag is amazing!! LOVE the pops of color! i am in LOVE with the new F+C emerald bags! I love the jade colored F+C bag! It definitely stands out with the black&white dotted blouse. Love the look :) And the nail polish shade is too cute! I love all of the colors in these photos! Spots and green bag- Brilliant! Love the entrie outfit and the bag adds a lovely pop of colour! Loving the nail colour too! Love the pop of color in this outfit! Gah, I love this blouse so much! I have been on the hunt for a polkadot blouse for at least a year now, fingers crossed our h&m has this next time I go! And lovelovelove it paired with the emerald clutch! Such a great color! Such an adorable outfit. !Love the punchy color of green added to the ensemble by the purse. oh, what a lovely outfit! 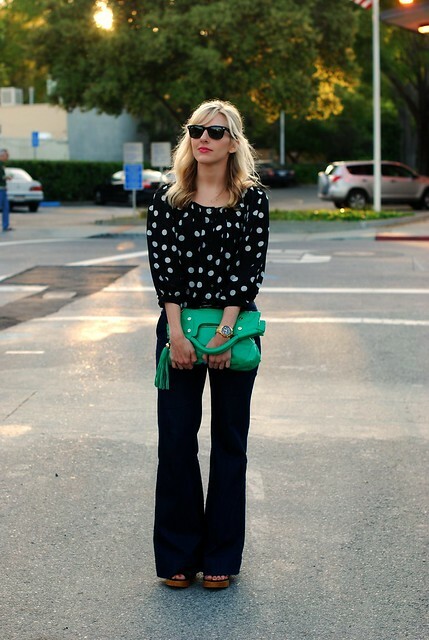 that polka dot top is fabulous and i love the punch of green from the purse! Gorgeous. I love the shape of your top and that gorgeous handbag. i love your bag popping against the black of your top! cute outfit Taylor! I really like your bag and nail color!! As always you look amazing. LOVE that green bag!! And I might need to add a bright blue polish to my collection, yours looks fantastic! Your green Foley + Corinna bag is absolutely GORGEOUS; I love it! And you look so chic in your floaty top and wide-legs. Love the top. I just posted a very similar look! I am loving the pop of color! It is great! love the outfit! that bag is seriously amazing!! polka dots and pops of colors are two of my favorite things so you can imagine how this outfit is just sooo perfect for me! <3 love it! Love that nail polish color. I recently had a similar color on my toes and it always brightened my mood! Love the color of the nail polish and tote. Have a good monday tay! I haven't purchased pants for FIVE years, and recently I just bought a pair of dark denim flares, which I'm in love with! They are definitely the new skinny. Obsessed. The pop of color in your bag really brings together the whole look. Love it! You look amazing, one of my favorite outfits! The bag really makes it pop. Love the pop of color from your nails and bag!! H&M has some really cute bloses at the moment, I havent seen this one though! simple, chic, beautiful! Love the lipstick too! Of course I heart your F+C lady bag ;) Looks great paired with some darks, Taylor! This is so my kind of outfit! Super chic. Wow, this outfit is too cute. I love the polka dot blouse, bag, and that nail polish. I have to buy that nail polish. Love all of this! The blouse, nail polish, purse & flowers! Feel better, darling! Hope you're getting LOTS of fluids and rest! Great nail color and that bag is superb! I love your top! I've been trying to find a polka dot top for a while now but haven't had any luck yet. I love this! Your bag is perfect and the polka dots are so cute!! absolutely love the blue nails taylor! love the blue nails! How fun. 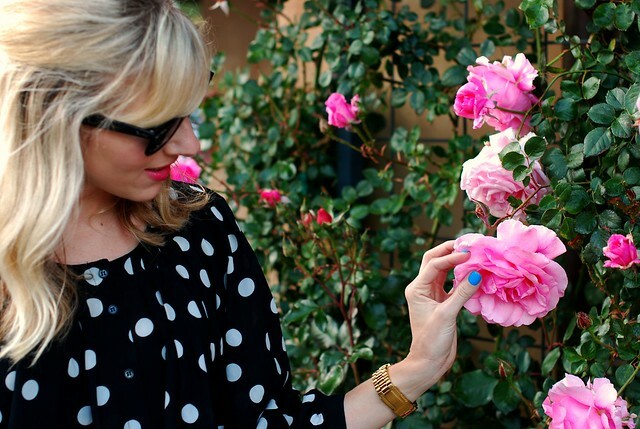 Polka dots are so pretty in the early spring! Enjoy the beautiful blooms and have a great week. I am LOVING the bright greens right now! that handbag is marvelous! ...and there's that lovely bag that I just covet every time you use it! I think you were wearing a version of this outfit on Saturday and you looked so spectacular, as usual. Damn I love this outfit. 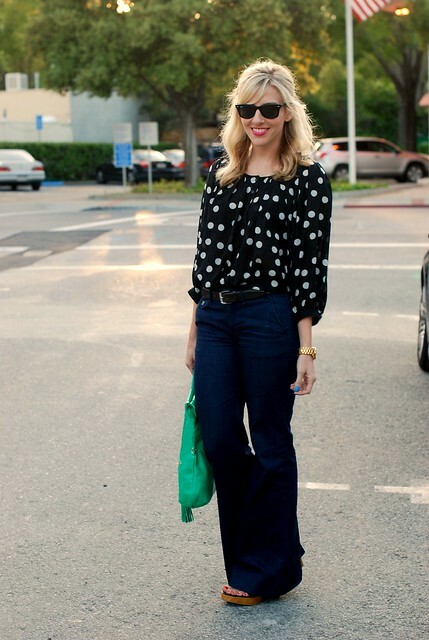 I heart the polka dot top, blue nails and beautiful bag! Nice pops of color! It's refreshing (and also makes me jealous) to see all these pretty colors on you and in the scenery. It SNOWED in Chicago today! love the dots and the green! beautiful pictures!! Love the color of the Foley and Corina bag!! This outfit rocks! It's so perfect for day OR night! Love the polkadots. There's something about the pattern that's just so classy and fun! Love the polka dots with the pop of green! After reading this post, I had to go out and buy that polish! I am obsessed, but it looks much cuter on you! 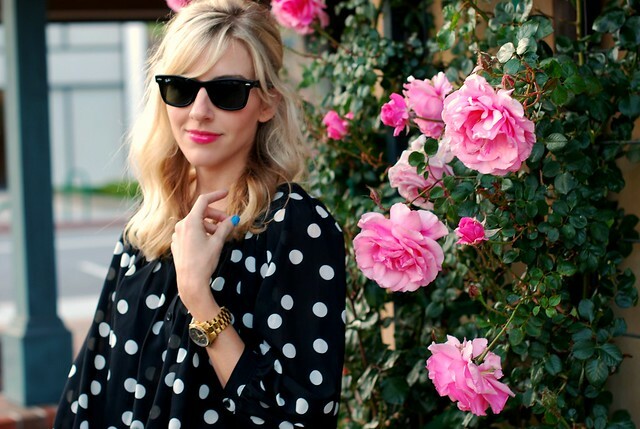 love the polka dots, and that clutch is such a gorgeous color! great look! what color lips are you wearing, impressionista? I love your nail color! So bright and fresh for spring.